Welcome to the FreeAdSystem.net blog. Here you will find the latest updates for our Free Advertising System. Please visit often to stay informed. 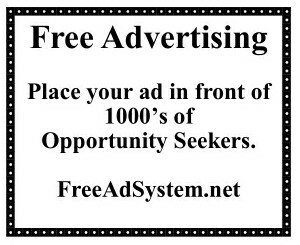 The MAIN reason you want to advertise at FreeAdSystem.net is because we focus on organic traffic. Advertising online is great but results can be limited. If your websites are not getting on the first page of google, then you are more then likely having to pay for traffic (most of it is crap) or forced to use free sites with upgrade features. The problem with free or almost free traffic is the fierce competition. Plus the fact that everyone is trying to promote the same programs to one another. This is the main reason why 93% never make money online. YOU NEED A CONSISTENT FLOW OF FRESH ORGANIC TRAFFIC. Here at FreeAdSystem.net, we're always testing different traffic sources and have pretty much concluded that it is very costly financially to advertise online. Even if using free sites, you'll spend to much time trying to generate leads and sales with little to no results. After all..."Time Is Money". So what is the solution to getting organic traffic at an affordable rate? Magazine ads, small circulation newspapers, tabloids, co-op ads, ad sheets etc. 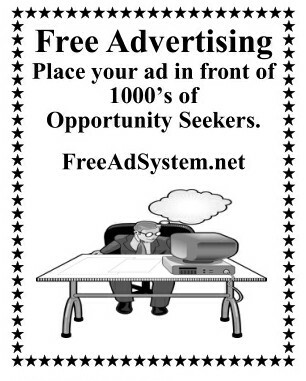 EXAMPLE: Placing a 1" ad in a magazine for opportunity seekers will cost about $50 for a circulation of 25,000. These folks are the exact type of people we are trying to reach. Plus, magazines are sold on news stands where they can be available to FRESH new impluse buyers. There are even smaller publications with circulations anywhere from 1000 to 10,000 copies printed. A 1" black and white ad like the one above could cost anywhere from $1 to $10. Keep in mind, these are all opportunity seeker publications. There are literally 100's of them across America. The only problem with print advertising is it takes time for your ad to appear in the next issue. Publications can be printed monthly, bi-monthly, quarterly or even anually. You just have to be consistent with advertising and be in it for the long haul. Our first ad is breaking this month (March 2019 - The Color Ad Above) and I have already started placing more ads in different publications. Don't get me wrong, we still advertise online but we are trying to get FRESH eyeballs on the site viewing YOUR ads. The good news is most of these opportunity seekers will be viewing ads and not posting ads. This keeps the board from being saturated with ads and will give advertiser's more ad views. So I hope you can see the vision we have and will want to support us by placing a free ad or upgraded ad today. We will be offering typesetting and print advertising services to you guys very shortly so you can promote your own programs once we figure out what works and what doesn't.